How times have changed. During the referendum campaign a no deal scenario was dismissed as ‘Project Fear’ to undermine concerns raised by the Remain camp. Then it became a negotiating technique to prove to the EU the UK was serious about walking away from a bad deal. But now no deal has become something even ministers are warning about because there is so little time left to negotiate with the EU and the Conservative Party is still at war with itself. Jeremy Hunt, the new foreign secretary, told his counterpart in Germany that no deal is looking increasingly likely if the EU doesn’t change its negotiating approach. He then went onto suggest that UK voters would blame the EU if a no deal Brexit occurred. Nothing to do with it taking two years for the UK government to agree a negotiating position then? How Likely is No Deal? Although recent events might indicate there is an increased likelihood of a no deal Brexit, the evidence suggests it is not in the interest of either the UK nor the EU. Indeed, is talk of a no deal Brexit simply a cynical tactic of hard-right wing MPs to push through Brexit without proper parliamentary and public scrutiny? Brexiteers and the government certainly don’t want the public to become aware of the cost of Brexit or the fact that the benefits they were promised are not going to be delivered. Remember the £350m a week for the NHS or the easiest free trade deal in human history? Brexiteers know they only have one chance of getting the UK to leave the EU as people are gradually becoming aware that Leave lied and cheated to persuade people to vote for Brexit. 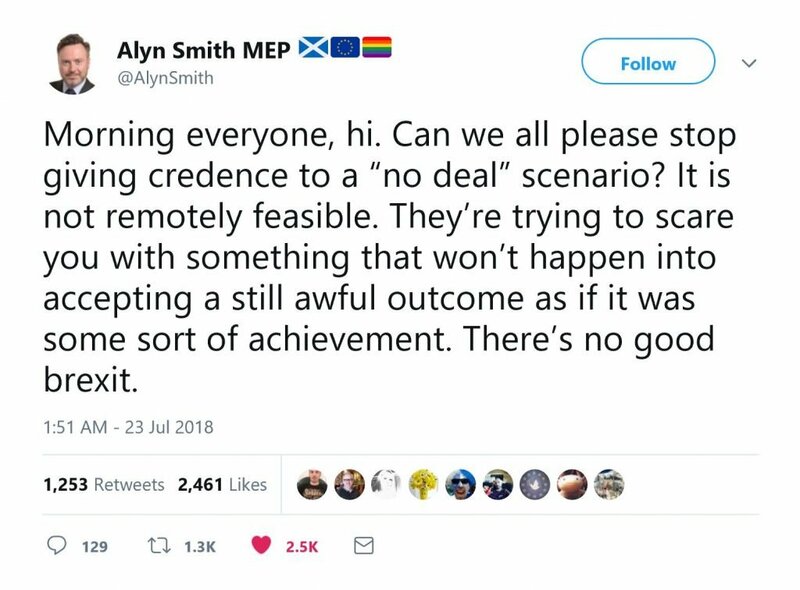 Why Will No Deal Not Happen? 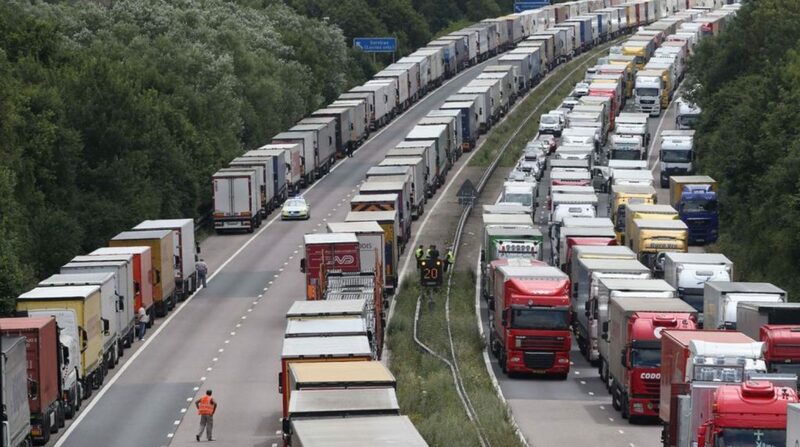 By making people worry about the prospect of a no deal Brexit the government and hard-right wing Tories are trying to distract from the real consequences of Brexit. They want us to be grateful when at the last minute a deal is negotiated with the EU. They don’t want people to compare the deal with what they were promised. Getting a last minute deal suits the Brexiteers as there will be less time to scrutinise the details. There are also other reasons why a no deal Brexit won’t happen that the ERG and the government don’t want to highlight. Why tell people the truth if it makes them question the whole premise of Brexit? If the amendments and votes on the trade bill have taught us one thing it is that there is no clear parliamentary majority for any single type of Brexit and definitely not for a no deal Brexit. Both main parties are split by Brexit and there are rebels on both sides of the debate. This means there is likely to be deadlock in Parliament when a final deal is agreed with the EU. Further, before the referendum a large majority of MPs were in favour of remaining in the EU. It would seem unlikely that their obsession with carrying out the “will of the people” will go as far as allowing a no-deal Brexit which would be catastrophic for the UK economy. Major manufacturers like Airbus and BMW have already indicated a no-deal scenario would result in plants being moved to other EU countries and massive job losses. Even MPs know they can’t blame job losses and a recession on voters. John Major: “It’s possible the earth is flat, but not very likely.” Andrew Marr show, 22nd July, 2018. The hard-right Conservative MPs in the ERG claim Brexit will allow the UK to negotiate more beneficial free trade agreements with other countries, especially the US. However, a no-deal situation would undermine this strategy because no country will want to negotiate a trade deal with the UK until they know what access we have to the EU single market of over 500 million people? Much the UK’s appeal to foreign governments and companies is closely linked to our relationship with other EU countries. The UK is much less appealing and would have less negotiating power if our relationship and access to EU markets is unknown. Whether you think planes will be grounded or not, even small delays at major UK airports can cause travel chaos and prevent budget airlines turning around quickly. These airlines depend on keeping costs low by being able to quickly turnaround and fly to their next destination. A no-deal scenario would destroy this business model because of the UK not being part of the EU Open Skies agreement and because of the additional time needed for passport and security checks at both UK and EU airports. The government has already ruled out the idea of UK only queues for our airports and so this means delays even when returning to the UK. A no deal Brexit would end cheap air travel in the UK and fewer people would be able to afford foreign holidays. Imagine how this will be perceived by voters who were told Brexit would be easy and we would have the exact same benefits. Parties and politicians associated with such a policy would suffer from a huge backlash from voters. Even ERG MPs wouldn’t like to be blamed for an end to cheap foreign holidays in Spain etc. Whether you believe “they need us more than we need them” or not, a no-deal scenario would be deeply damaging for both the UK and EU. Both the UK and EU know that no deal would cause massive economic and social problems. It’s in no one’s interests and would probably lead to a public backlash for any party in government at the time of a no deal. This does not mean the EU will roll over and agree to the Chequers proposal. Michel Barnier has already dismissed large elements of the proposal. However, it will put pressure on both the UK and EU to compromise in some areas and most likely force Theresa May to abandon some of her red lines. Due to the current ‘back-stop’ agreement for Northern Ireland if the UK dropped out of the EU without a deal Northern Ireland would remain in the customs union and single market. 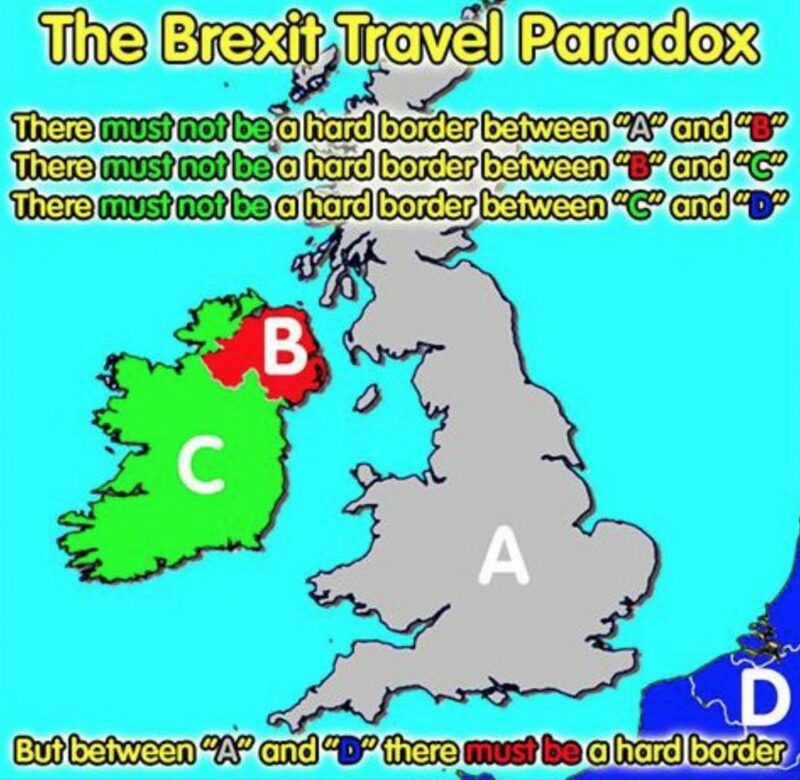 This would result in a border between NI and the rest of the UK and would almost inevitably lead to renewed calls for a referendum on the unification of the island of Ireland. No deal prolongs uncertainty for everyone involved in the negotiations. It would just extend the pain of leaving the EU and prevent the UK having the agreed transition period to maintain the UK’s access to the single market. Given that some in the government had claimed it would be the easiest trade deal in human history this would further undermine the legitimacy of Brexit. The boss of Amazon for example thinks that a no deal Brexit will lead to civil unrest within weeks of the UK leaving the EU. Even if he is wrong it will certainly create a huge amount of uncertainty and chaos in everyone’s lives. Do politicians really want to be remembered for causing such pain and suffering? Even though it is more than two years since the referendum the hard-right Brexiteers have not been able to outline a detailed plan for Brexit. This is because they know that the UK can’t get a better deal than we already have with the EU. The UK has more opt-outs than any other EU country and is not in the Schengen Zone or in the EURO. Whenever the ERG talk about their vision for Brexit all they can do is repeat meaningless platitudes about taking back control and sovereignty. That’s because they use no deal as an avoidance technique to hide they have no plan. “Many of the things they [Leave] said were absolutely pie in the sky.” – John Major, 22nd July 2018. Hard-right Brexiteers are using the threat of a no deal Brexit to distract attention away from their own failings. Brexiteers have no plan, no benefits and only one chance to deliver Brexit. What they hope is that by focusing on a no deal scenario people will feel relieved when a last minute deal is agreed with the EU. This suits Brexiteers because people will be less likely to notice the deal lacks the benefits they were sold to vote Leave. Given that it has taken the government over two years to produce their first proposal for their future relationship with the EU it does make it more difficult to get a deal agreed by October. But it is more likely that they will seek an extension of Article 50 rather than drop out on no deal. However, EU commission official and senior diplomats have indicated they would only consider such an extension if there was significant shift in UK politics. This would require either a general election or a second referendum. Given the catastrophic consequences of a no deal scenario such a shift in UK politics may be the only way out for the May government. This appears to be more likely than a few months ago as an increasing number of Conservative and Labour MPs come out in favour of a People’s Vote. The deadlock in Parliament may force May’s hand as the only way to avoid a no deal Brexit. That’s why it is important that people continue to argue for a referendum on the final deal as it may offer the only way out of the current stalemate. As a result I expect a general election or a referendum to be announced in October 2018. May can only kick the can down the road for so long and that road will hit a roadblock in October. Why Brexit must be stopped – 46 reasons MPs should stop Brexit now! The suitability of referendum – Are referendum a “device of dictators and demagogues”?